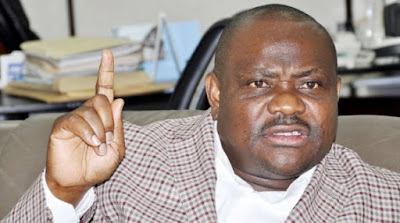 Nyesom Wike, governor of Rivers state, has advised President Muhammad Buhari not to give Rotimi Amaechi, any appointment in his cabinet. Describing his predecessor as the most corrupt government official in the country, Wike said Buhari’s anti-corruption campaign would suffer if a man like Amaechi served in his government. Given the role Amaechi played in the emergence of Buhari, there are reports that the director-general of the APC presidential campaign will be considered in Buhari’s cabinet. “If Buhari is sincere in his fight against corruption, let him probe the Amaechi’s government and he will discover that there cannot be a government official that is more corrupt than Amaechi,” Opunabo Inko-Tariah, Wike’s special adviser on media and publicity, said in a statement issued on Sunday. “From the genesis to revelation of his government, Amaechi’s fiscal recklessness and dictatorial policies and approaches are responsible for the financial woes of the state that should ordinarily be buoyant. “A man like Amaechi must not be allowed to flaunt the fruits of his crime with impunity. He has to account for the monthly allocations he received in 8 years and the IGRs for the same period. He spirited so much out of the system with little or nothing to show for it. “The appointment of Amaechi by Buhari will be an endorsement of corruption by Buhari,” he said. The governor said if Amaechi was blameless, he wouldn’t be seeking protection from investigation. “If there are no skeletons in his cupboard, why try to frustrate the Hon Justice Omereji’s commission of inquiry? This obviates the need for further evidence that his hands are dirty. After all, he started and ended his reign with the late Justice Kayode Esho’s panel and the Prof Odinkalu’s commission of inquiry respectively -not to talk of that headed by Justice B A Georgewill. ‘Do unto others, what you want others to do unto you’, our Lord Jesus admonished my brother Knight, Amaechi. “The attempt to stop the Hon Justice Omereji’s Commission of Inquiry from investigating his government is not only risible but shameful and highly provocative. It is ironical that the same man who sealed the judiciary for close to two years and turned lawyers into taxi drivers and artisans will now have the gumption to approach the same courts he desecrated for justice.